From his sheer dominance in the ring to his polarizing personality out of it, Muhammad Ali will be remembered as one of the greatest boxers and humanitarians in history. We can learn from his attitude and from his words. This small collection of his pearls of wisdom will inspire you for years to come, and it might just give you even more appreciation for the world’s favorite champion. 1. Muhammad Ali Likes to Move It, Move It. 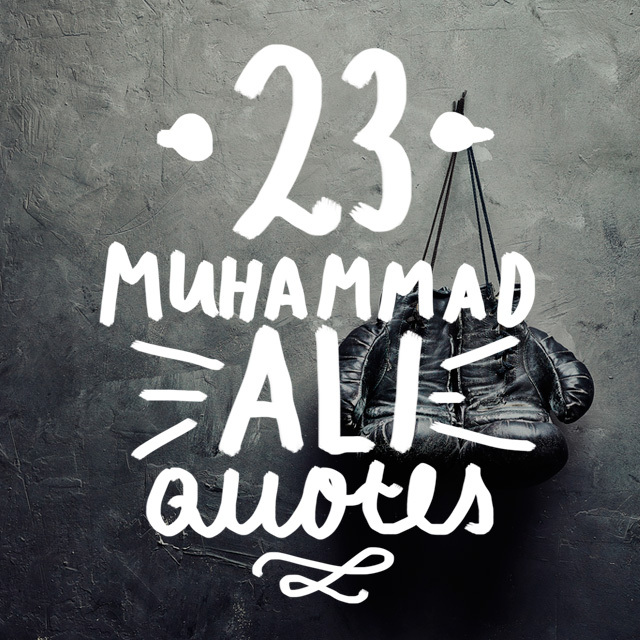 We start with Ali’s most famous words. He said these words to reporters describing his approach to fighting. He floated around with grace and beauty but had the punch that stung like a bee. At the time, he was the most balanced boxer that ever lived. No one could move so gracefully, think so quickly, and strike so hard. He was a model for every boxer that came after him. 2. 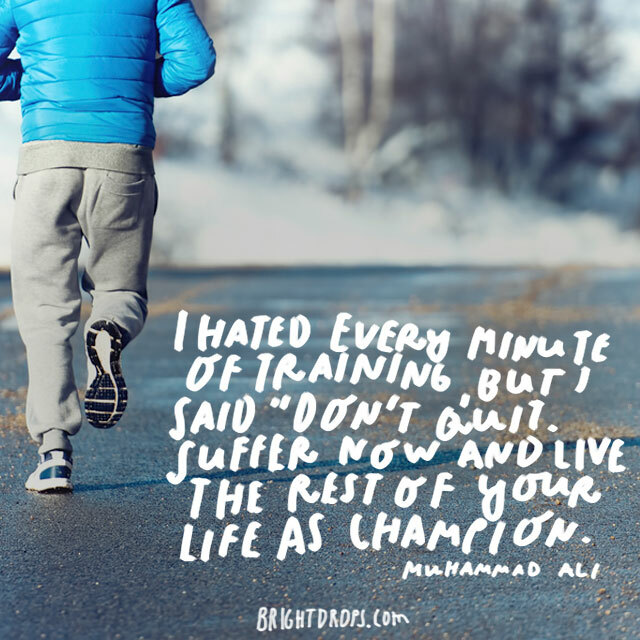 Muhammad Ali on Training. Training is the hardest part of everyone’s day. It was no different for the greatest fighter we’ve ever known. You can state this every which way: No pain, no gain. The reality is that if you don’t hate training, you aren’t human. 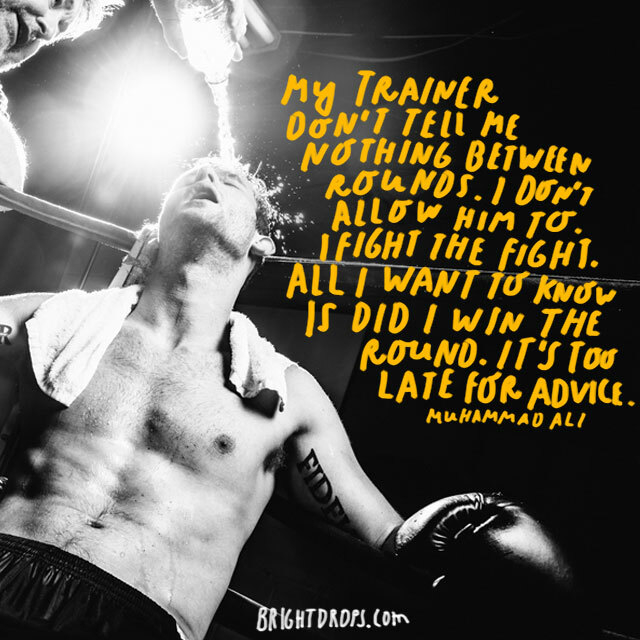 The difference between Ali and us was that he knew that the training would make him a champ. 3. Ali Wants to Be Friends. The most important lessons are not learned in school. Muhammad Ali had a wild adventure of a life. From his early years to his years spent on the run, he knew the value of having people that would stand by you through thick and thin. All of us know the importance of having those people in our daily lives. Take the time to tell them thank you while you still can. Do it in his honor. 4. Even the Greatest Made Mistakes. Despite having a career that asked him to beat people, Ali was a gentle and caring person. He had the arrogance that we saw in the media consistently. Yet, there was a humble side of him we rarely got to see in the spotlight. The truth for everyone is that our purpose is to make life better for those around us. 5. 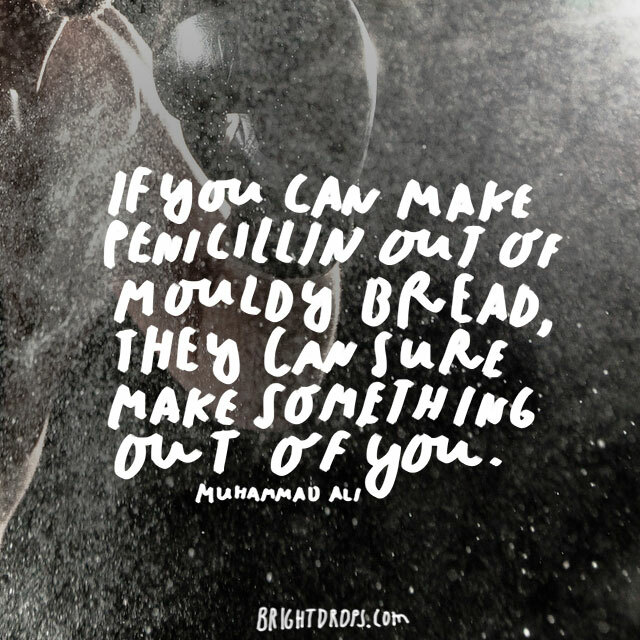 Muhammad Ali on Moldy Bread. 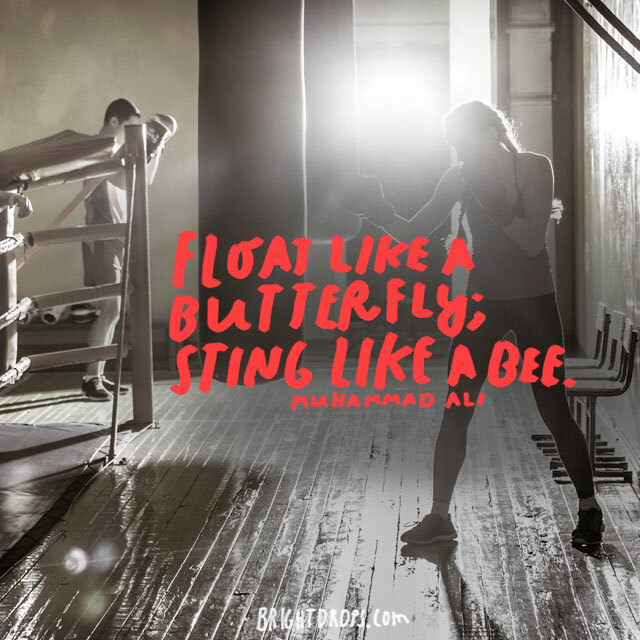 Always the optimist, Ali had a way to find the bright spot in everything. He never had a problem making lemonade. This original quote found a way to put a beautiful spin on something ugly. When mold grows, we just see ugly and nasty. The best and the brightest among us see opportunity. 6. 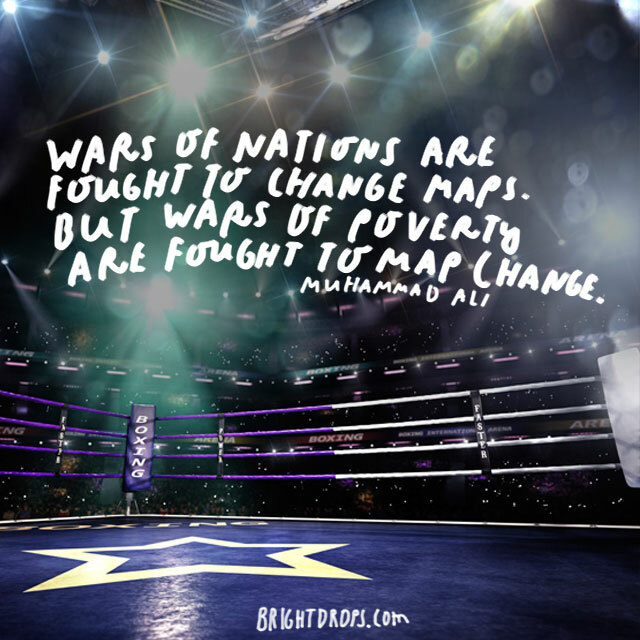 The Champion on Why We Wage War. Ali came from nothing. There are a lot of people that claim to rise from nothing. Many of them are like Drake. Sure, Drake has achieved a great deal, but he started as Canadian so he couldn’t have been that close to rock bottom. Ali literally started from nothing. He used every ounce of grit and determination to become the best in the world. 7. Muhammad Ali Doesn’t Feel Old. Your mind tells your body what to do. 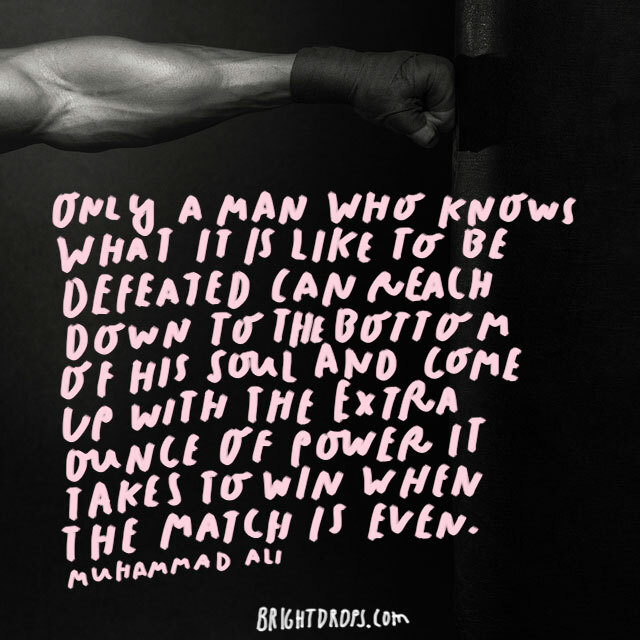 Muhammad Ali was one of the first athletes to push himself well past his prime. In fact, he won a title fight against Frazier and Foreman who were 2 and 7 years younger, respectively. Muhammad Ali even made comebacks to the ring despite the doctor’s advice. 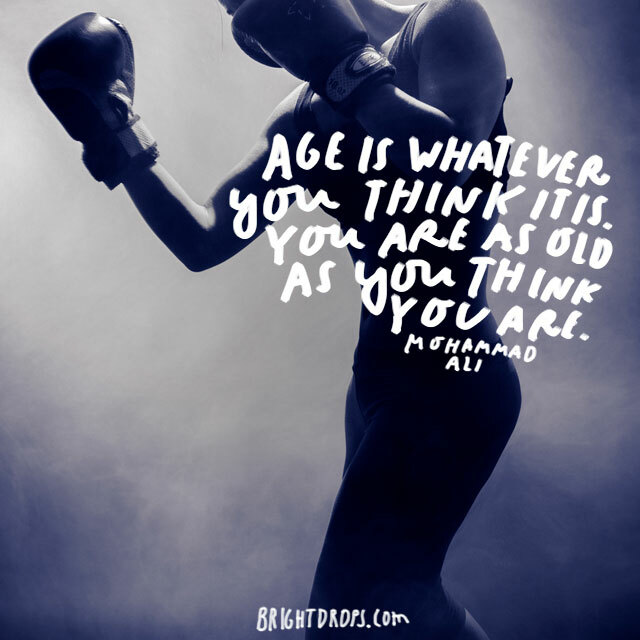 He never looked at his “age” to determine what he could or could not do. 8. 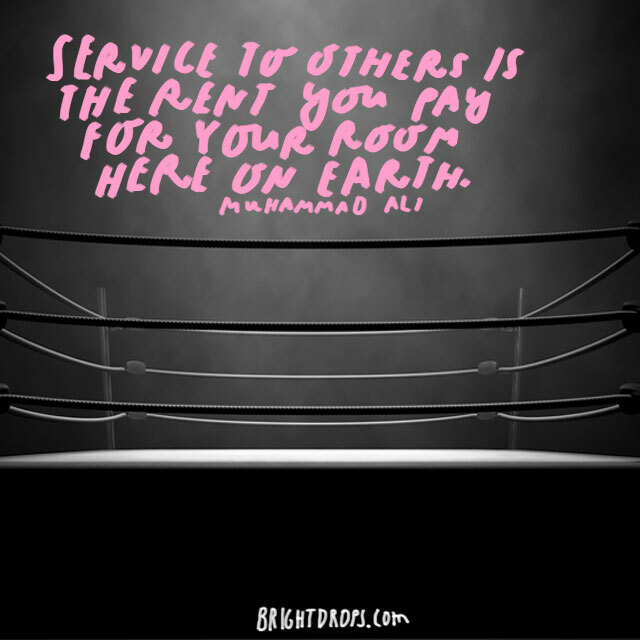 Muhammad Ali on Serving Others. 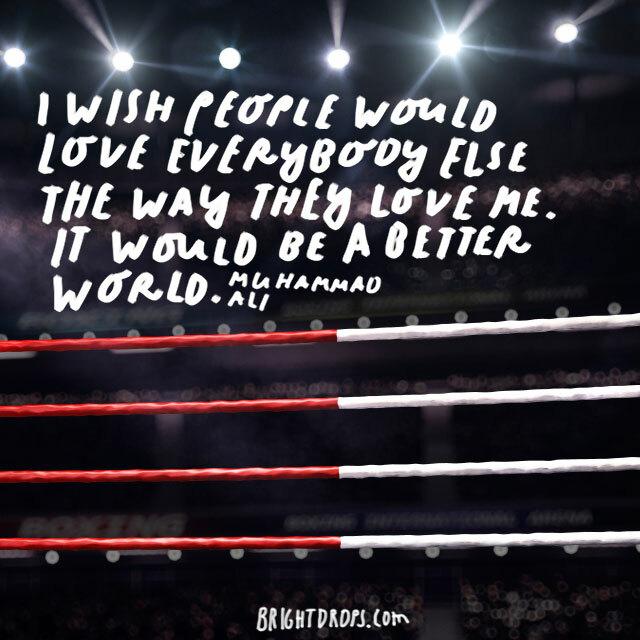 Even a big, strong, powerful man like Ali realized that the purpose of life is to live here in servitude to others. After his success, he went to slums all over the globe teaching and preaching about love and pride. He never asked for payment, but that’s because you couldn’t put an appropriate “appearance fee” on what he did for the people in those places. 9. The Champ Knows When It’s Time to Put Up or Shut Up. When you are in the heat of the battle, there’s no time for coaching. 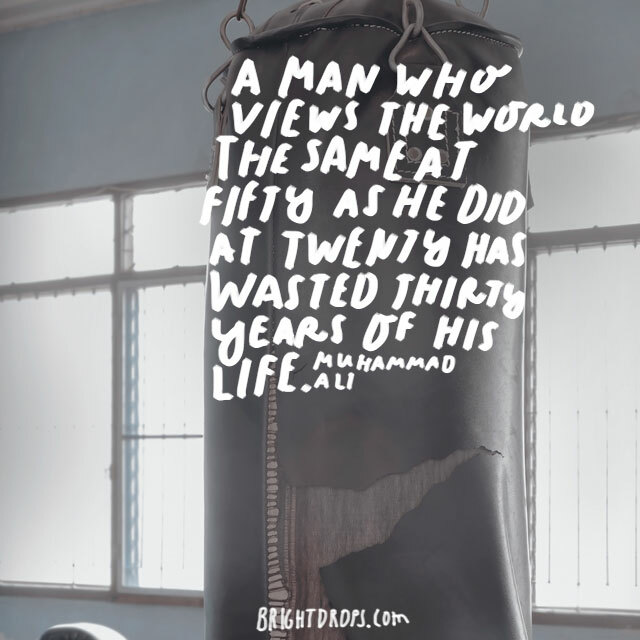 This can apply to life, the same as it applies to boxing. So many times we look around for some advice or help, when really we should be out there throwing punches and fighting the good fight. 10. 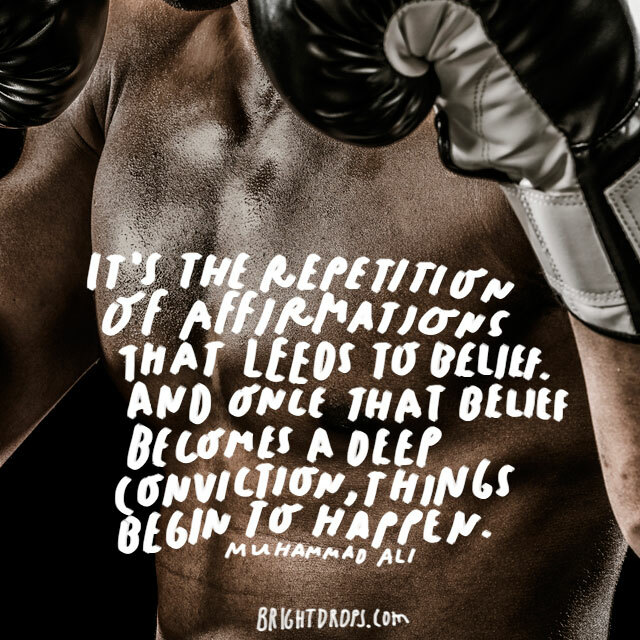 Ali on Building Belief. When you reaffirm yourself, you believe it. For Ali, that was about his sense of pride as a fighter and his value as a human. We can all learn from that attitude he carried. You must believe in yourself if you ever expect anything great for your life. We can all be the very best at what we do as long as we believe that we can. 11. 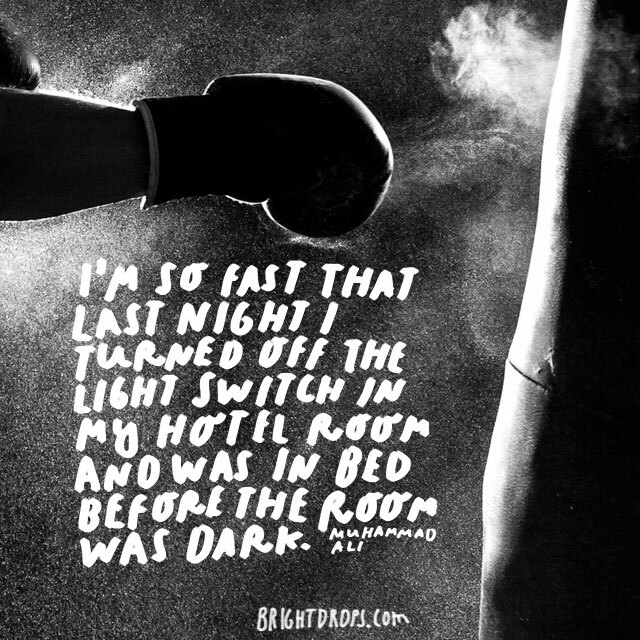 Muhammad Ali Is Fast. This is a humorous little joke for our midway point of the list. Muhammad Ali was a funny man. He always loved to tease the media and his opponents with his strength and speed. When he was asked about losing some of his speed at age 32, he joked that he could outrun light. It is hard to say if he really believe it himself. 12. The Greatest Is Very Good Looking. 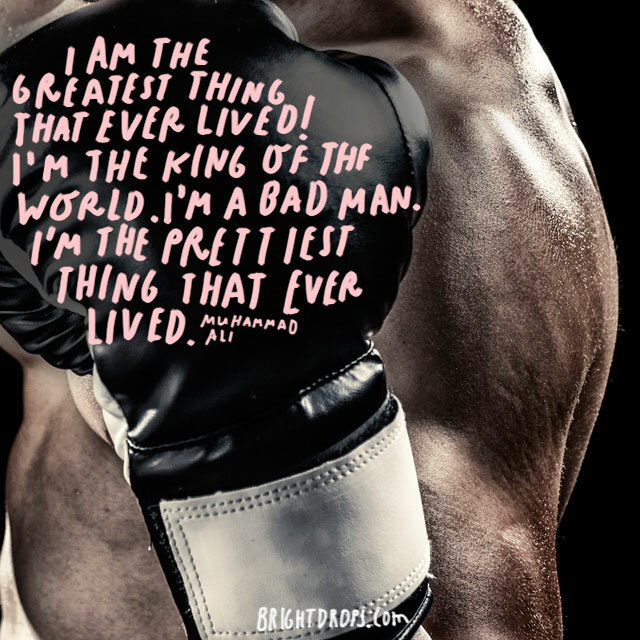 This is one of Ali’s affirmations. 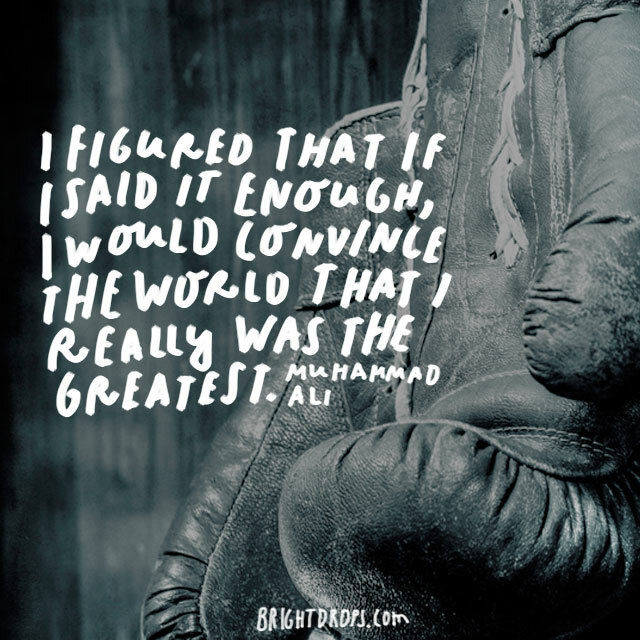 He continually told himself that he was the greatest. He did not stick to affirmations simply about his sport. He made himself believe that he was the kind of the world. If we could all push ourselves to become the king of the world, the entire paradigm of life would shift. 13. Muhammad Ali Feels the Love. There’s no question that, in the height of his career, Muhammad Ali was the most polarizing figure in sports. Despite the love-hate relationship he had with the world, he always saw the glass as half full. He looked at the negative attention as attention. That must mean that everyone is talking about him because they love him. What a brilliant and inspiring approach to negativity! 14. 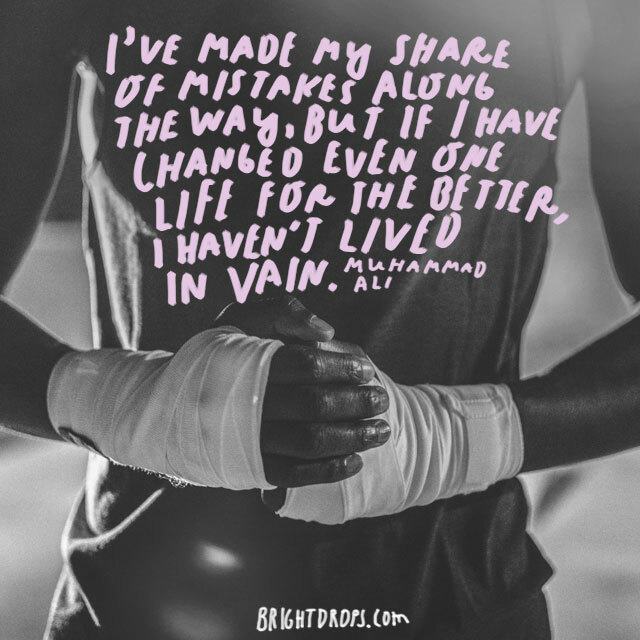 Ali on Changing Over Time. After his career, Ali had a lot of time on his hands. He filled that time by becoming a figure head for equality and fairness in the world. He traveled to and fro, all over the globe championing the cause of peace and love. The fervor he had as a young man had subsided. Instead, he saw the world through his newly adopted Sunni beliefs and looked at equality as the goal, not bitter bickering over social status. 15. 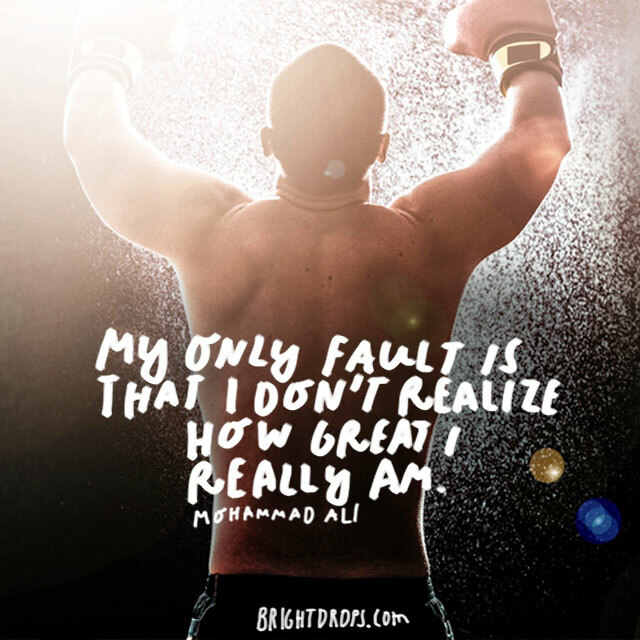 Even the Greatest Has One Fault. When Ali said these words, he meant them with a bit of sarcasm. I think we will all remember him for being greater than even he thought he was. Despite his larger than life ego, he was a better man than even his words could’ve given him credit for. He spent his entire life pushing and fighting for equality around the globe. 16. 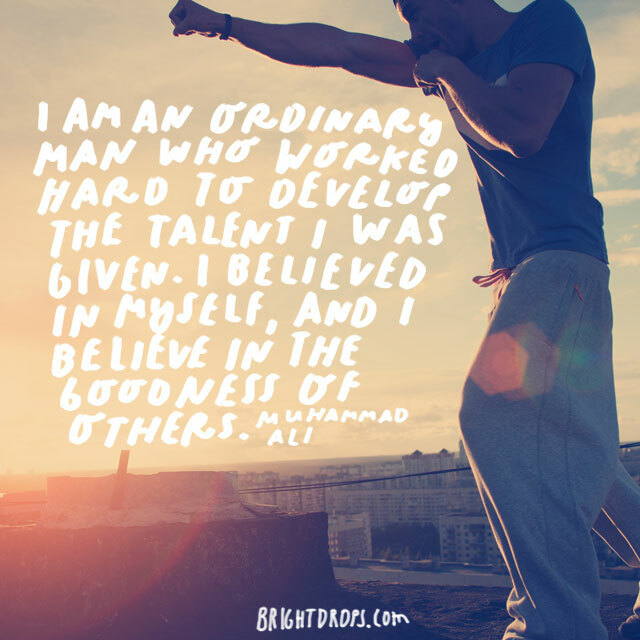 Muhammad Ali Believes in Others. Even some of his most formidable enemies in the ring admired Ali as one of the best examples of a man they’d ever seen. 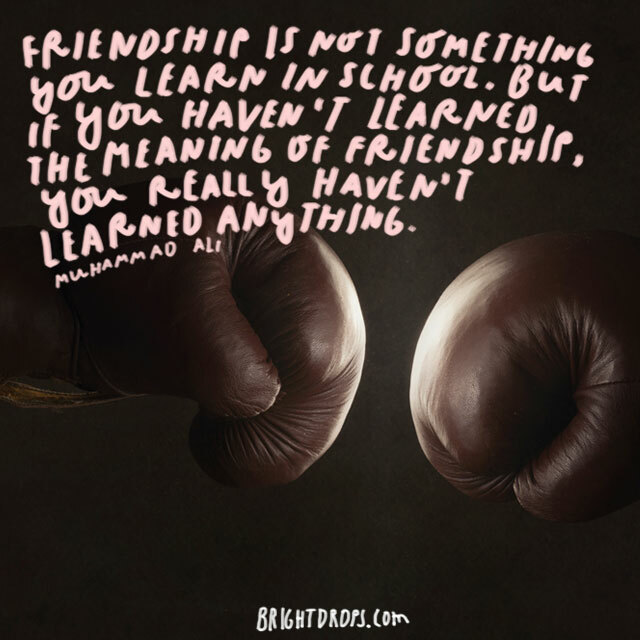 Frazier and Foreman considered Ali a close friend. Ali was always quick to give credit where credit was due, just never before himself. If we could all be as courteous as he was, we might make friends much easier. 17. 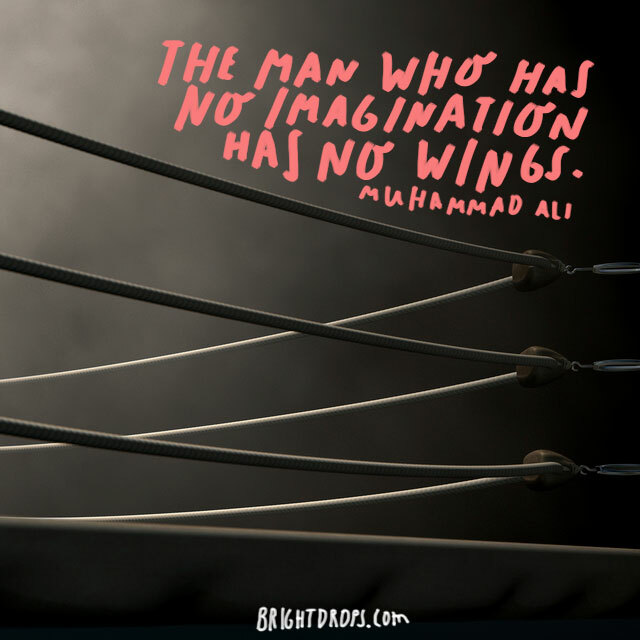 Muhammad Ali Has Wings. If you cannot picture yourself holding your title belt, whatever it might be, then you can never get there. You must be able to see yourself with that finished novel, that business you want to start, that brand new car you’re saving up for. You have to see those things in your mind’s eye before you can bring them to fruition. 18. 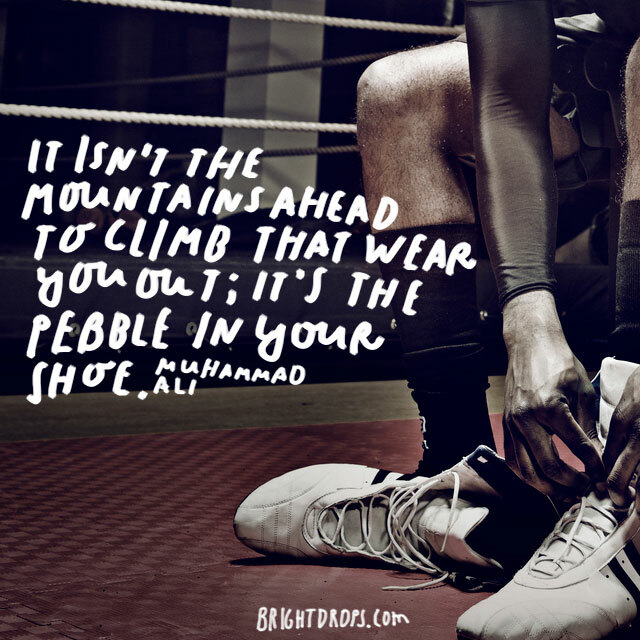 Muhammad Ali on the Importance of Comfortable Shoes. When you are pursuing these great and intimidating dreams, you must look inward. Most of the time, if not all the time, you are your own worst enemy. Find the pebble in your shoe and get rid of it. That tiny pebble that you put off another day will be the thing that brings you down into failure in a week. 19. Ali Does What He Wants. 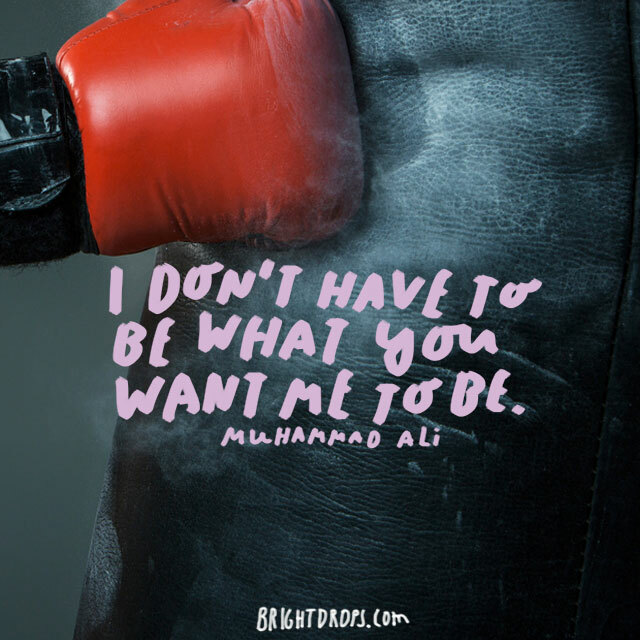 One of the greatest lessons we can learn from Ali is that we don’t have to settle for anything in life. Whether someone is pushing you to pursue a dream that isn’t yours or someone is telling you that you can’t get where you want to, you have to realize that you are in control of your own destiny. You are the master of your own fate. 20. The Champion on Becoming a Champion. When you hit rock bottom, you are learning a valuable lesson. Until we face the worst defeat, we can’t know how it feels. When you reach rock bottom, you know that you never want to be there again. That’s where resilience is born. You will begin to fight harder than you have ever fought before. 21. The Greatest Ever Doesn’t Lose. This is the type of determination that is born in the darkest hour. You have to know that you are stronger than anyone or anything that may oppose you in life. When you do know that, you need to develop the pursuit of your dream to the point that you want everyone to yield to your desire and your strength… or get out of your way. 22. 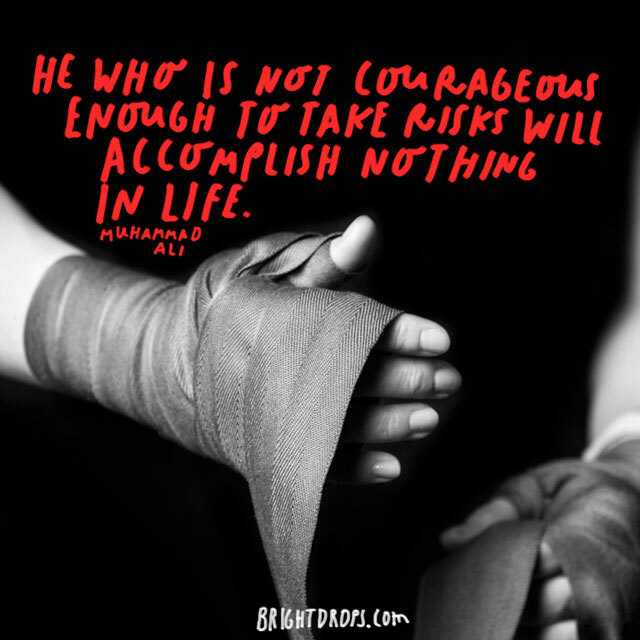 Ali on Taking Risks. If you never develop that courage in your heart, you won’t accomplish anything. If you want something bad enough, you’ll find a way to get it. Whether you’re looking for a promotion from your cubicle or a gold medal in the Olympics, you will find a way to get there and make that dream a reality. 23. Muhammad Ali on Subliminal Messages. The way you make those dreams come true are to repeat it over and over. What you believe, you manifest in your life. You don’t sit around and let life happen around you and just hope that things work out for the better. You must develop the belief in yourself and then make the world believe it, too. That’s how you make your dreams come true. 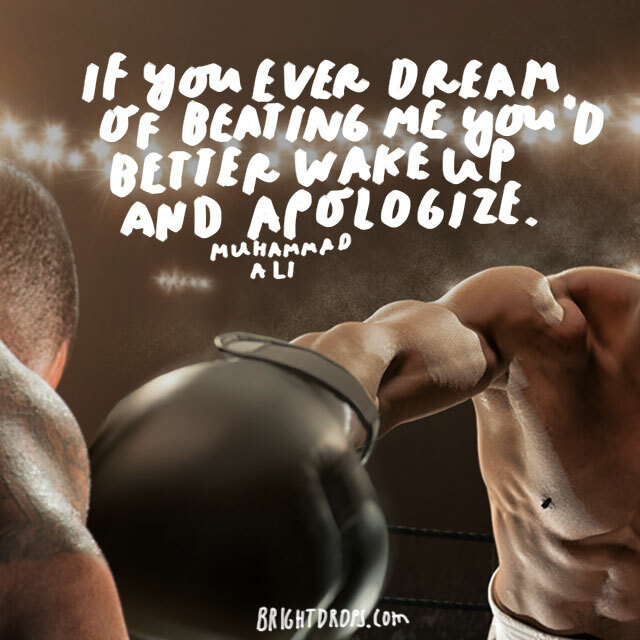 That’s the real lesson we learn from Muhammad Ali. Love these, he was so profound and hilarious all at the same time.